Keeping your home protected and secure is Job 1. Unlike other systems that piggyback on your cable or phone connection, Alarm.com systems have a dedicated cellular connection so you can count on reliable, uninterrupted service. Save energy and stay comfortable, without compromise. Alarm.com’s Energy Management Solution connects all your devices into a responsive system that helps you save automatically. Control your smart thermostats, lights and sensors in a single app, and get instant alerts when the temperature changes. Get truly smarter savings with an Energy Management Solution that combines easy to use automation, location-based optimization, intelligent learning, and triggered automation. With GPS Vehicle and Asset Tracking, you're in the driver's seat. Enjoy amazing, hands-free home control with voice commands. Save money and conserve energy with thermostat control. Control your locks whether you're at home or on the go. Control lighting for ambiance, energy savings and security. Keep and eye on your home and family anytime, anywhere. Best-of-breed security solutions for every member of the family. 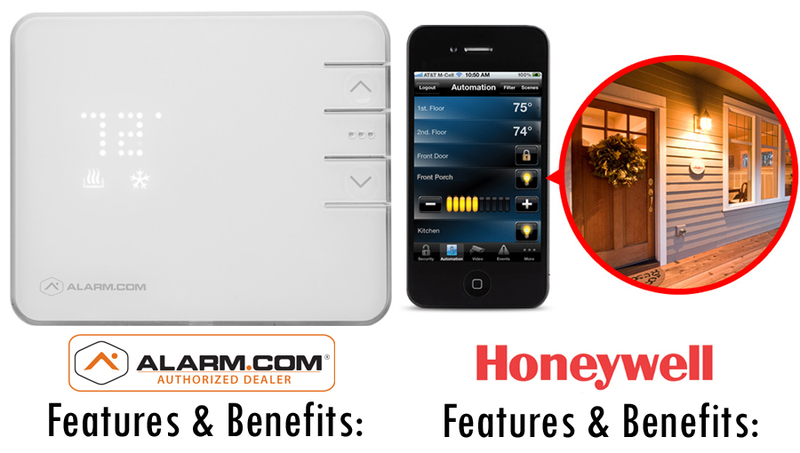 Honeywell Total Connect gives you total control of your home.